Opening with the calming sound of wind sweeping across the plains, Flyin’ West is pure Americana, evoking the broad grandeur of big skies and big hearts full of freedom. It is 1898, and a chosen family of black women have settled in the all-black town of Nicodemus, Kansas. 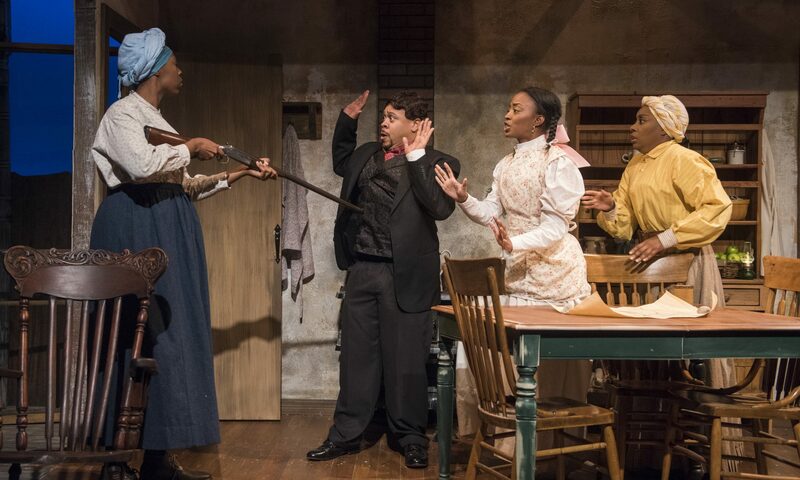 American history in most classroom settings rarely acknowledges the existence of African-Americans outside of slavery and the Civil Rights Movement, yet the Backstage Guide provided by American Blues Theatre in conjunction with the production, does a wonderful job of correcting this history of erasure. Settler Sophie Washington (a stoic and grand Tiffany Oglesby), less than a generation out of slavery, has found nearly inconceivable peace miles away from the city and malicious white folks. Quite understandably, she is prepared to do anything to maintain the sanctity of her home. Middle sister Fannie Dove (an ebullient Sydney Charles) is courting gentle neighbor Wil Parish (a refreshingly understated Henri Watkins), and elder Miss Leah (Joslyn Jones in a heartwarming role) leisurely fusses about in her golden years. Everything seems just about as perfect as can be until youngest sister Minnie Dove (a complex and sophisticated portrayal by Tiffany Renee Johnson) and her husband Frank Charles (Wardell Julius Clark shining in a truly challenging role) arrive from London and upset the near idyllic peace. It is hard to overstate the significance of Black women owning their own property in an era where Black people were property. Women faced a double whammy of oppression; first due toracism, and again through the sexism of men who demand deference. Frank’s entitled masculinity immediately clashes with the unapologetic feminism of Sophie, a woman who cleans her shotgun on the front porch. Flyin’ West is unique in that it gives voice to the heartbreaking grief, anger, and hopelessness that Black men and women struggled through post-slavery. How does one cope with the PTSD of being beaten, watching friends murdered, or having their children sold away? For men, laying their burdens down on their women provided solace. However, Black women simply endured, even while crumbling inside. Not only does the play interrogate the assumed mandate of Black women’s responsibility to heal Black men, it also tackles the staggering complexities of colorism in that era. Frank was raised in proximity to whiteness and becomes seduced by the temporary respite it offers, and tortured by the fact that he cannot truly escape the detriment his Blackness brings upon him in America. Once cannot casually dismiss race as a construct after witnessing the futility and tragedy of a man trying to escape himself. Director Chuck Smith has an excellent eye for cultivating setting, allowing it to bring just as much character as the extraordinarily compelling ensemble, to marvelously rich effect. At its core Flyin’ West is an expansively glorious tale of bravery, freedom, and sisterhood guaranteed to set your soul free. Flyin’ West produced by American Blues Theatre runs at Stage 773 until November 3, 2018.